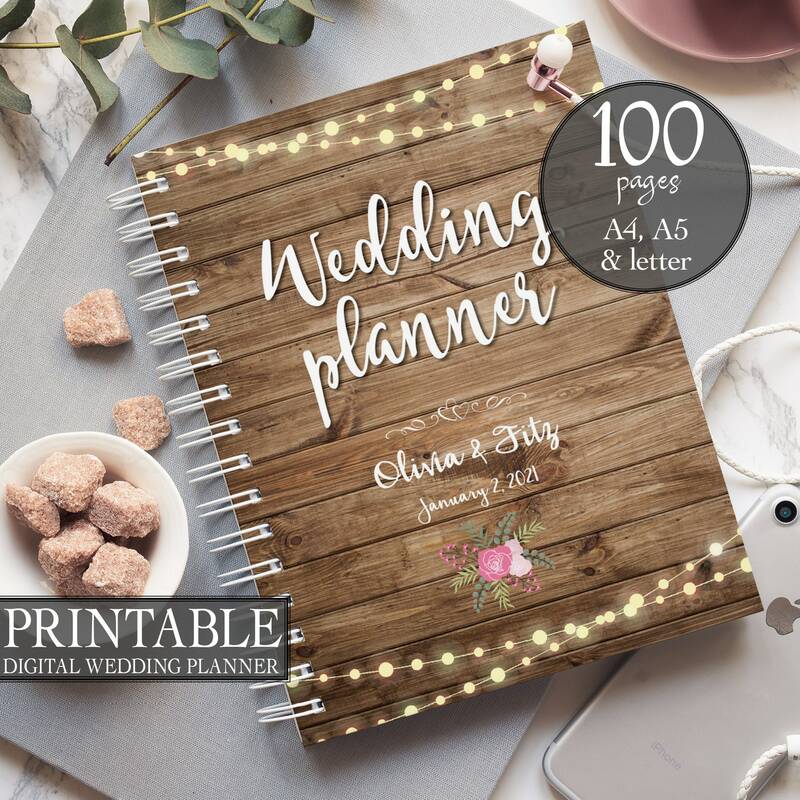 This is a wedding planner with 100 unique pages (including personalised cover page), each page can be printed as many times as you need. 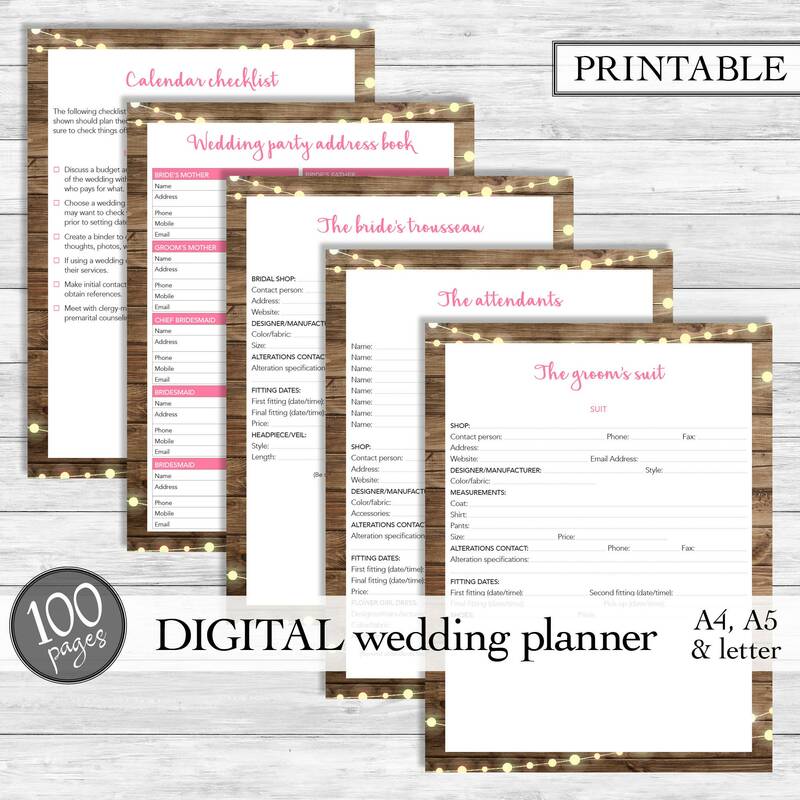 It has everything you need to plan a wedding. This is a digital file, no physical item will be sent. 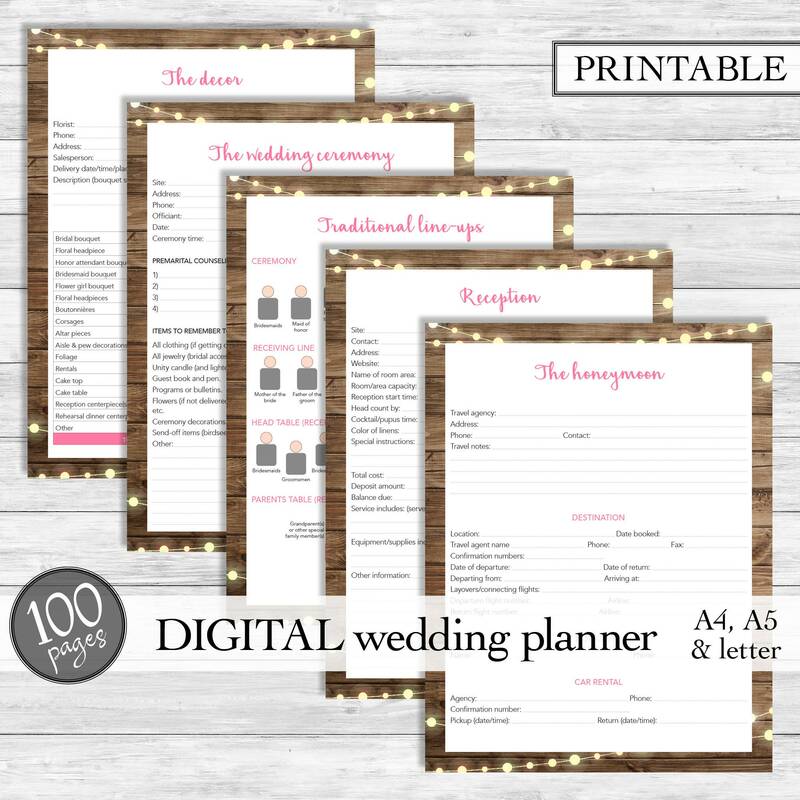 100 pages: 8.5 x 11", A4 or A5 size in PDF format - please let me know which size do you need in the Personalization box, during checkout. 💟💟 💟How to personalize cover page? 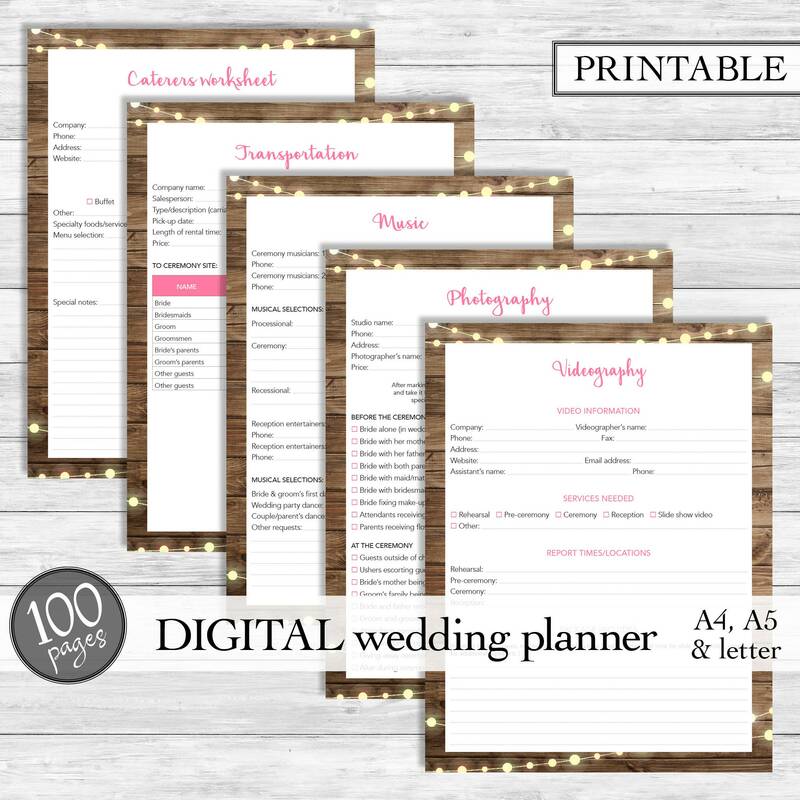 •	In the Personalization box, during checkout, enter all the information (names and wedding date + size of the planner - letter size, A4 or A5). •	Add it to your cart and checkout! •	Please note, any kind of changes to graphics, fonts, design layout and backgrounds are not included. •	You will receive your customised cover page in 1 business day via Etsy convo. •	You will have the opportunity to review the cover, and two rounds of proof revisions are allowed. 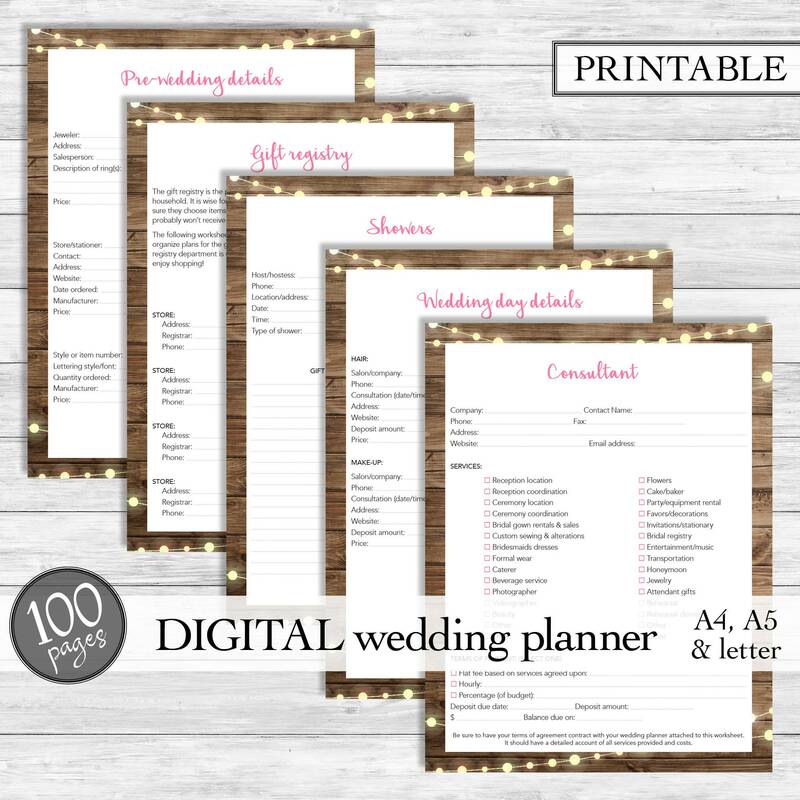 Some brides use Fedex or Staples printing and binding. The cheapest option is printing in some local print shop, they know all about binding, as well as Fedex. And about the papers, bottom line is - better paper, better print. I'm usually using regular card-stock paper but it looks good on thinner paper too. Note: If you will need preprinting version with bleeds (some print shops ask for it), just let me know. These files are available for instant download. Once payment is confirmed, you will receive notice with your download link to your Etsy e-mail. But you have to wait for personalised version - I'll send you a link when I finish the cover. You will get 1 PDF file that you can print at home or at a shop. You can print as many copies as you need. No physical item will be sent. Good planners are very hard to find in stores and the ones you do find are okay but not the best. I have to say I love this planner!! 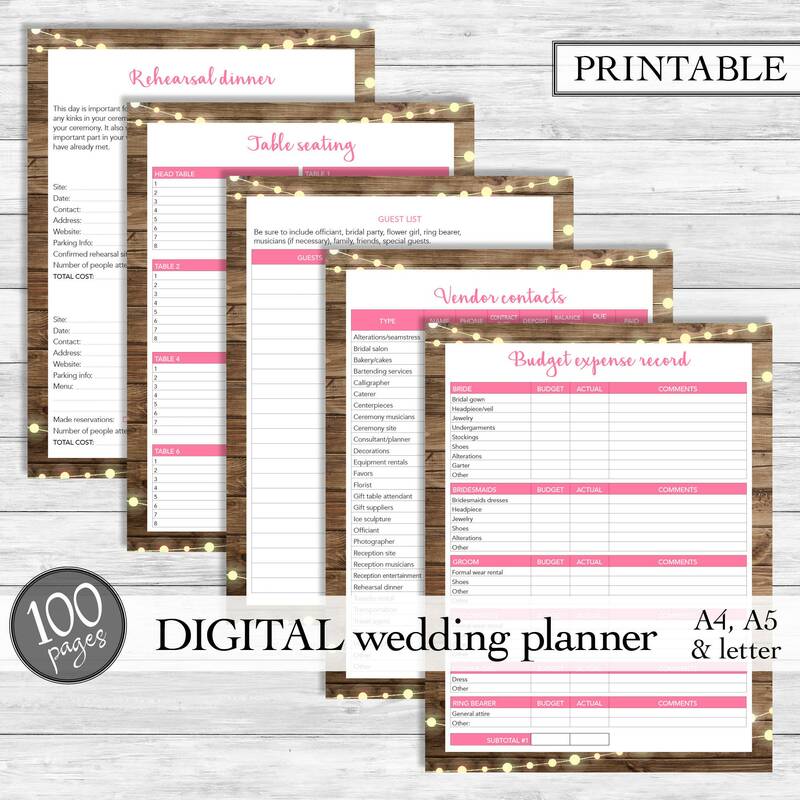 It is perfect for what i need and has a list for everything! I also love the design fits my scheme perfect! Had my cover page very quickly. Would definitely recommend. This is absolutely perfect! Giving it to a friend and can't wait to hear what she thinks! Gave this to my friend and she loved it! Print out instructions were very easy and clear!